Double Fine had already posted two videos on the remastering process in the summer and a short trailer showcasing what the new version will look like, although the differences don’t seem to be too drastic. This is entirely different than the work on the remastered versions of the first two Monkey Island adventures, when the graphics had to be completely redone from the original concept art and drawings – the same process that will be necessary for Day of the Tentacle, which still used the 320×200 resolution and will have to be completely re-digitized or perhaps even redrawn. What Double Fine is doing now with Grim Fandango is very recommendable and important to make the game fit for the future and make it available again, since it has been out of print for ages. But it is still more fixing age-related limitations and porting the game to newer systems than completely remastering the whole game. There has been no mention if the static, pre-rendered background graphics, which make out about 90% of the visuals, are going to be upscaled or taken from perhaps still existing higher-resolution sources – but at one point “cleaning up dithering” is mentioned in the videos, so they might not have much more detail than the original. One improvement will certainly be better textures for the 3D models of the characters, but this has also been done before by some fan projects. The aspect ratio of the new version will still be in 4:3 and apparently an option to play the game with the original graphics will also be included, so that everything will be preserved. The October 2014 announcement also confirmed that the score will be rerecorded with a full symphony orchestra, which would certainly be an improvement, but most of the prize-winning original music still sounds amazingly good today. 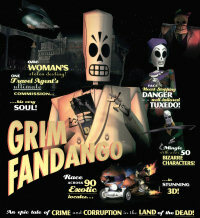 So, does that mean that the 1998 version of Grim Fandango is now ripe for the garbage bin? The improvements of the remastered edition, which is being released at the end of January, are really promising and seem very worthwhile, but are not an outright reason to completely dismiss the original incarnation of the game. If you still have your original discs, you can play the game with the help of ResidualVM, which has helped to run it properly for the first time in more than a decade. As mentioned above, I have started playing Grim Fandango again now and it feels like a whole new game on a reasonably big LCD monitor and the slightly better rendering courtesy of ResidualVM. I’m not sure if I’ll be getting the new version at all or if I will be even able to run it on my computers, but if you have never played or owned the game, have lost your copy over the years or want to play it on your PS4, I can only strongly encourage you to get the new remastered version of Grim Fandango despite all reservations! But what I’m personally actually more excited about is, of course, the remastered version of Day of the Tentacle and there’s also Thimbleweed Park, Ron Gilberts and Gary Winnick’s old-school point&click adventure successfully funded with a kickstarter campaign – but it’ll only be ready next year! Could it be, is 2015 the year the adventure genre is going to make another comeback? It certainly looks like it, and I like the early signs of it!